This is a shipping thread for my favourite Anime couple of all time, Sakura Kinomoto and Shaoran (sometimes spelled Syaoran too) Li. Both are the main characters in the manga and Anime by CLAMP called "Card Captors Sakura" and they also appear in another creation by the same all-female Japanese mangaka group named "Tsubasa Reservoir Chronicles". I personally love both characters individually and of course, they absolutely amazing dinamic as a couple. Oh, I adore Shaoran, I wish there was a guy like him in real life! Also, doesn't he look soooo handsome in both pictures, especially with that stunning red prince-like outfit? *drool* I have loved them since day 1. 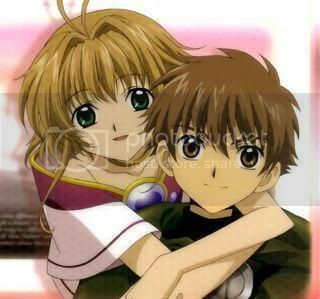 What are your favourite Sakura/Syaoran moments? For how long have you been shipping them? Tell us all about it and let us ship this wonderful couple! You have no idea how much I love them! They're like the sweetest and most adorable couple. I love Shaoran and his stubborness, but he's really determined and focused and very loyal friend too. And little Sakura who's also very determined and a very good friend and she's very unassuming, which is something I really like about her. What I really love about them both, is that they complement each other, you see how they acted and were at the beginning when they met (they didn't get along) and how they change and their relationship blossoms. Sakura helped Shaoran be more relaxed and not always over the edge. And Shaoran helped her be more focused and not let her emotions overtake her. I just love them. I love them!!! I love all those little moments movie 2, and in the manga the last chapter, I haved finish the mange of TRC so I'm waiting tell I read the end. I'm so glad Clamp took them off the shelf to play.